Wow… feeling completely overwhelmed – after 5 months of limbo, panic and frustration I get a call Wed 10am last week from the council saying it’s happening NOW – scaffolding being erected as we speak. Four days to sort everything before the demolition contractors get back on site… Dropped everything- and by Sunday had finished numbering the bricks- 4,168. Monday arrives and things are (thankfully) slightly behind, scaffolders still to finish. 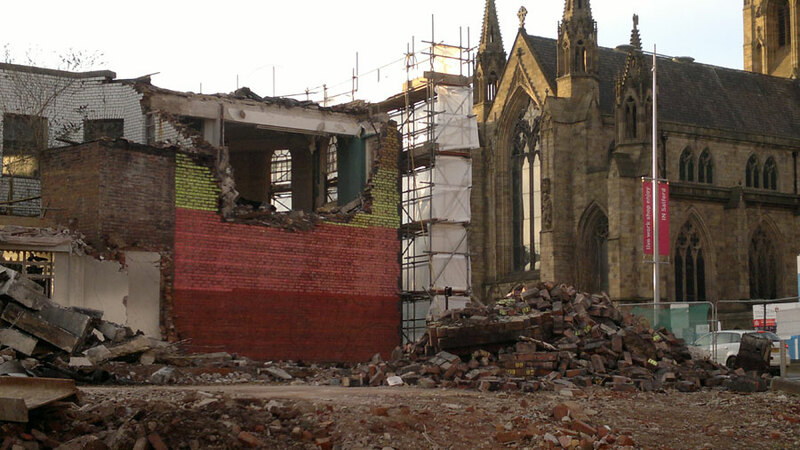 Site manager estimates The Wall will start coming down starting 3rd March, after demolition of the remnants of the building adjacent. Further complications on Thursday and now there’s at least 3 weeks more before The Wall comes down- hallelujah. 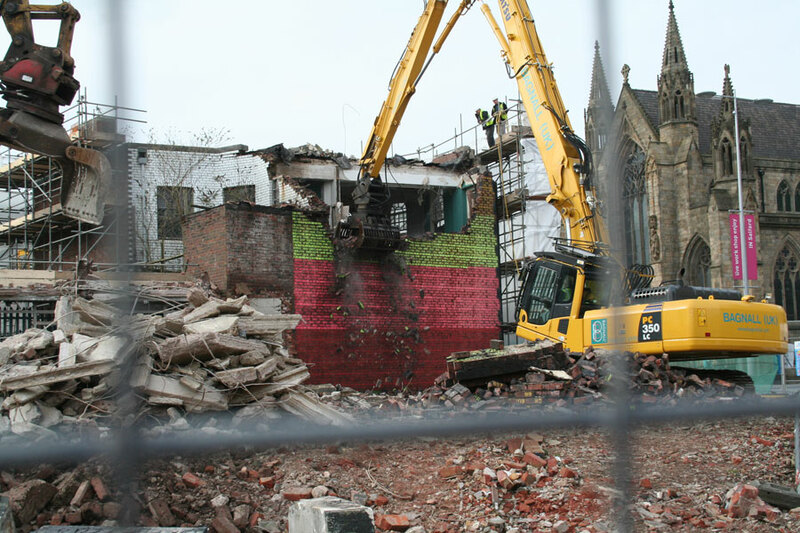 I go for a meeting at Islington Mill and by the time I get back, it’s changed- order of the demolition rearranged so that the Wall is back on for Monday or Tuesday. No more reprieve but fine. Friday rolls around- everything’s pretty calm, they’ve even managed to save me the bit of ornamental molding from the top of the Bank Theatre. Amazing. I keep taking photos and suddenly John says- we’re taking it down now. W T F… So not ready for this and on top of it my camera is on the blink and phone/video camera decides it’s about to die. F**k f**k f**k f**k f**k. Do I have time to run and get my 16mm? No… and a horrendous 15 minutes ensues hovering outside the fence shaking my beyond moody camera to get it working thinking this cannot be happening- the demolition of The Wall, two years of my life, I can’t even.. this cannot be for real. The crane hovers above the roof, John comes back over and says they’ll take an early dinner i.e. now and then start on The Wall. I’ve got an hour. And with dying phone send out an SOS…. Still making sense of it all but there’s one thing I know– THANK YOU Bill Campbell, Maurice Carlin, Jo Atkins, Kim Irwin, Paddy Shine, Chris Haslam, Alex Macarte, David Williams, Mariel Osborn, Alex Hindle for coming to the rescue– I’d have totally crumbled without you all! 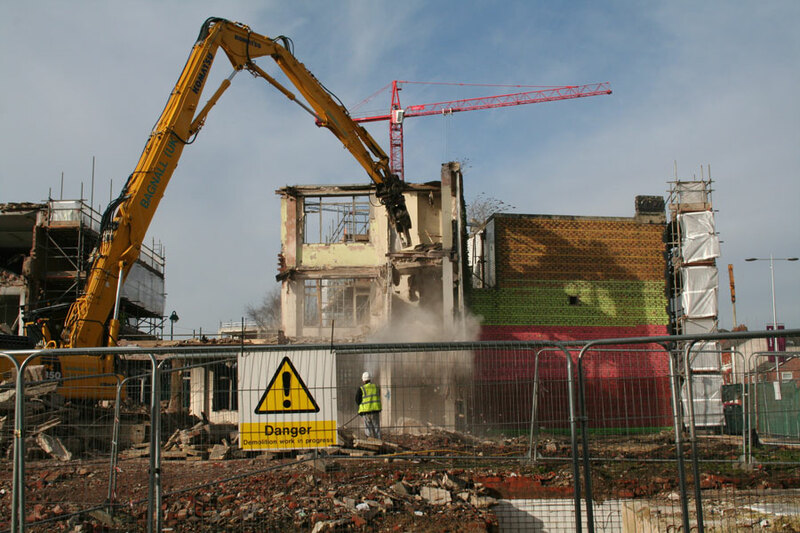 Much more to come in the next days/weeks/months… but for now, if anyone fancies seeing what’s left of The Wall and the Old Bank Theatre- demolition resumes Monday 7.30am…. 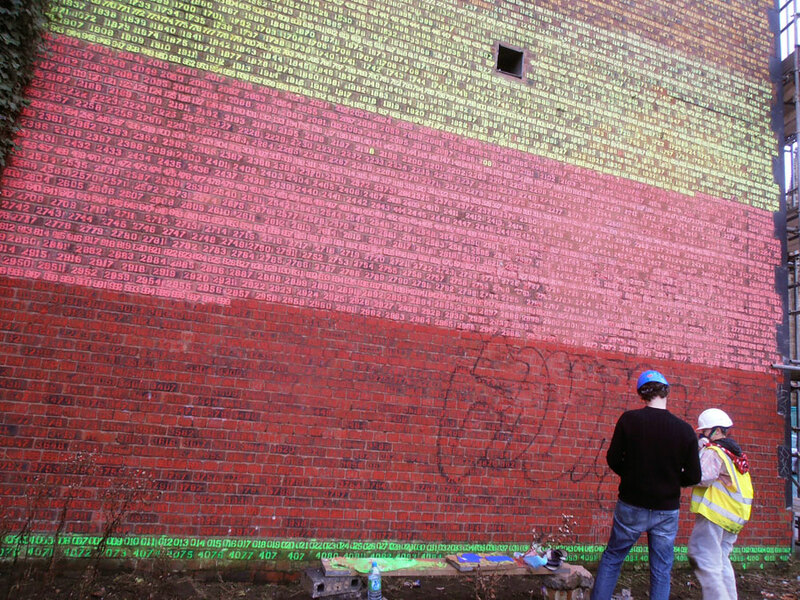 24 Feb 2014 – finishing numbering with help from Liam Howard. Photo by Jo Atkins.